FHA reported to Congress that the Mutual Mortgage Insurance fund (MMI) has returned to the black for the fiscal year ending 9/30/2014. In an independent audit, it now shows the MMI with a positive reserve balance of $4.8 billion, up from the previous year of -$1.3 billion. While the latest report reflects a $6.1 billion turnaround for the agency's insurance pool, the fund's current capital ratio is only 0.41 percent, well below the 2 percent level FHA is supposed to maintain per Congressional mandate. Still, it means the agency won't require another bailout—as it did last year for the first time in its history. The improved performance was due to increased FHA premiums (including life of the loan charges), stepped-up underwriting criteria and an improving economy. The CFPB is serious about enforcing the LO Compensation law that states a loan officer cannot be paid on the terms and conditions of the loans that they originate. The CFPB recently fined a residential lending institution $730,000 for steering customers into higher rate loans. The institution also paid its loan officers a quarterly “bonus” based upon a sliding scale that increased as the borrower’s interest rate increased. 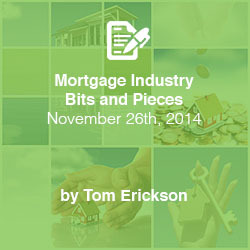 According to the CFPB, the program affected more than 1,400 borrowers. The $730,000 will be paid to these borrowers as compensation and the company has been ordered to end its illegal compensation system. HELOCs (home equity line of credit) has surged this year according to TD Bank, suggesting a rebound in consumer confidence related to rising home values. The uses for the funds derived from the HELOCs were quite varied with home improvements leading the way followed by debt consolidation, major home purchases, education costs, and emergency funds. TD Bank's first Consumer Borrowing Index randomly polled 1364 HELOC borrowers to make their assumptions.